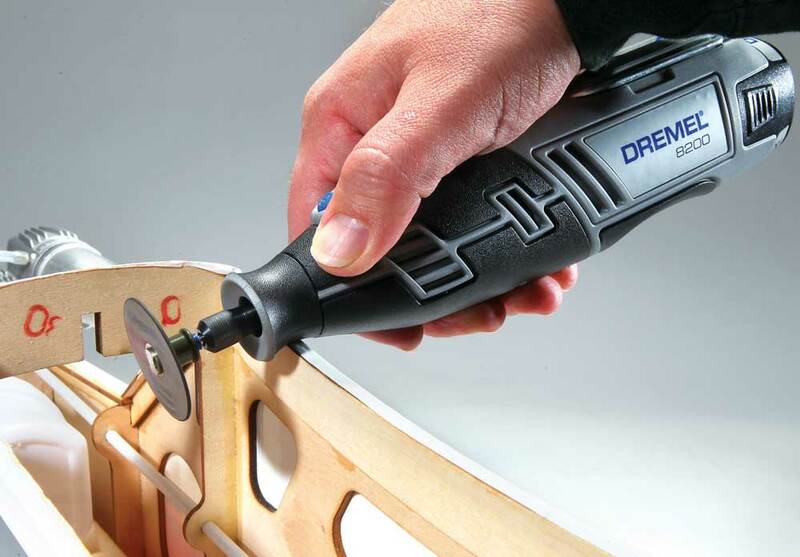 It really does not matter if you are into model airplanes, helicopters, sailplanes, boats or cars, the new Dremel 8200 12V Max Cordless Rotary Tool is a “must-have” tool for your workshop and/or field bag. While there are hundreds, even thousands of uses in all kinds of hobbies that this tool can satisfy, I want to talk about why you should have the 8200 and what tasks it can help you with in the radio control hobby. > The 8200 has a variable speed range from 5,000 to 30,000 rpm which gives you maximum control and precision when working with a large variety of materials. > Accessory changes are very fast thanks to the quick collet locking system. 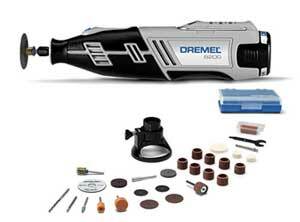 The 8200 can be used with all Dremel accessories and attachments. > The ball bearing construction gives the unit smooth and quiet operation. > The on/off switch is separate from the speed control so the unit will retain the speed setting for each consecutive use. >The 8200 is compact and lightweight with a new comfort grip housing making it easy to handle and control with less fatigue. > The high-capacity 12V Max Lithium-ion battery gives long run times and the built-in battery fuel gauge tells you when it is time to recharge. The battery will maintain its charge for up to two years while stored. Before I get into that, let’s talk about what you get with the Dremel 8200-1/28 kit. First off, they ship the unit in a durable plastic case bearing the embossed Dremel logo on the top of the cover. Opening the case reveals molded locations for each of the components in the kit so all the tools, accessories and charger remain in place and do not clank around during transport. There are molded tool locations in the main case so you can place your most-used tools within quick reach. 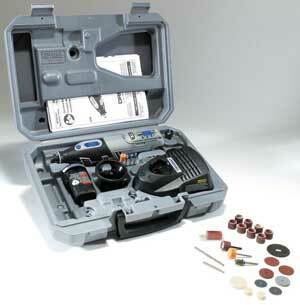 The kit comes with 28 genuine Dremel tools including a screw-on depth adjustment guide. A smaller, separate case is included to store these tools. These tools can serve a variety of tasks including: sanding, cutting, grinding, polishing, and engraving. From the hobbyist’s perspective, the sanding drums, cut-off wheels and grinding tools are ones that likely get the most use in your workshop. The heart of the 8200 is the new 12V Max Lithium-ion battery. This battery will last up to six times longer than a comparable NiMH battery and it has the ability to maintain a charge for up to two years while in storage. The included charger is designed to recharge the battery in one hour. I drained the battery six times while testing it on various projects and my average recharge time was 45 minutes. I love the fact that the 8200 has a built-in battery gauge which gives you a visual indication as to how much power you have remaining; no more starting a job and running out of power! Did I mention that the 8200 is cordless? I have an older Dremel rotary tool that is corded and while the tool works well, I can’t take it to the field with me and I always find myself where the cord is just a couple inches too short to reach where I need it. All that is gone now! The 8200 provides more power than my corded unit and it goes where I go. The grip on the 8200 is very comfortable and well balanced in my hand. At just 22 ounces, the unit is light so even with extended usage times; I don’t find my arm getting tired from holding it. When you combine the grip, balance and weight, you have a tool that can perform very detailed work where a steady hand is crucial. Changing the bit is very easy on the 8200. The lock button holds the collet locked with very little pressure. Once you have a bit in the collet, it stays in place and is very sturdy. I never had an issue with a bit flying out. The power switch is on the top of the handle just behind the lock button. It is easily within reach so you can power off the unit quickly if you need to. The variable speed slider is towards the back of the handle. It is a slide switch that is easy to adjust with a minor ratchet detent that holds the setting in position. Since your hand is at the base of the tool when in use, you never have to worry about accidentally hitting the speed control. • It’s cordless so you can take it to the field with you; no wires to mess with. • Tons of power – whether you work with balsa, carbon fiber, aluminum or steel, you will never be short on power. • Large number of applications that you can perform with this tool and its included accessories/attachments. WHAT CAN THE DREMEL 8200 DO FOR ME IN THE RC HOBBY? There are tons of uses for this versatile tool within the radio control hobby; too many to list them all, but here are a few of the most common uses where I find that the Dremel 8200 really makes my life easier. You don’t need to be building a kit airplane to appreciate the sanding, cutting and grinding tasks that this tool can perform. Most ARF airplanes come with a fiberglass or plastic fuselage. If you are installing a gasoline or glow-powered engine then you are going to need to cut the cowl for muffler, engine head, and possibly carburetor clearance. This task is made simple with the sanding drum and grinding bits. There is plenty of power to quickly rough-out the opening yet it is precise enough to refine the opening to give you an exact fit. If you are into scale RC helicopters then you know how labor intensive fitting a fuselage and outfitting the scale details can be. The 8200 can be used to etch panel lines, cut fiberglass and aluminum parts and sand mounting brackets to achieve the perfect fit and finish. Sometimes you might want to install an engine or muffler that is slightly larger than the manufacturer originally designed the model for. 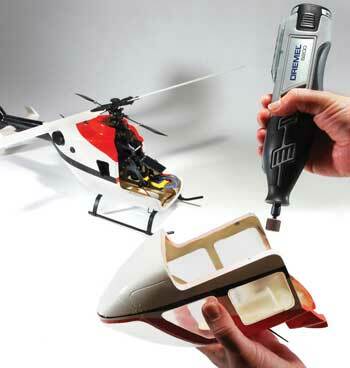 The Dremel 8200 will help you make minor modifications to allow you to get that powerplant into your favorite heli. Another common occurrence I have with helis is when I need to replace a fastener but the only replacement I have is too long. A quick slice with the cut-off wheel and I now have the exact length fastener that I need to get the job done. As I said, I cannot mention all of the uses for the Dremel tool in this article, but we would like to hear from you. Please visit our blog page at www.flyrc.com/dremel and leave a comment to tell us how you use the Dremel tool for your hobby application. I have been in the radio control hobby for over 20 years and Dremel rotary tools have been the most used tools in my workshop. The fact that I can have the power, versatility and precision that I have come to love from the Dremel products, but now its cordless and I can take it wherever I go puts the Dremel 8200 right up there with my screwdrivers as the “must have” tool in my shop and field bag. The battery life between charges is excellent so I know that I can get a lot of work done before I need to recharge the battery. You could opt to purchase the 8200-2/28 kit which comes with two batteries so you will never have to stop working on your model. The assortment of tools that come with the kit will allow you to tackle virtually any task on any RC model that you might have; car, boat, plane or helicopter. Previous Estes Proto X Nano Quadcopter – New Colors!